This Tuesday my wife and I were performing our civic duties and voting in our local Spring Election. We got to our local polling place, got our ballots and proceeded to our individual voting cubicles to cast our private votes. She finished 2 minutes earlier than I did, and when she asked why I had to tell the truth. 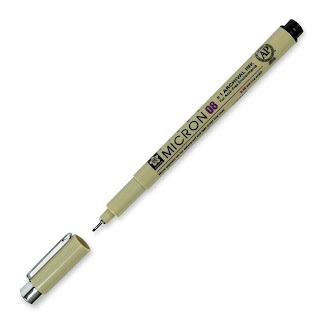 They had a Pigma Micron 08 pen and I was enjoying using it. Not only did I take the time to neatly and cleanly fill out the bubbles for my choice of Supreme Court justice and school board members with the smudge-proof pen, but I even voted for the local Court of Appeals judge and municipal court judge who were running unopposed. My wife was not so impressed, it was just a pen to her and I was just dragging my feet and keep us from a hot breakfast. I appreciated the pen for what it was though- a beautiful, well-crafted instrument of Democracy. I was only the 10th voter from my precinct at 7:10am, so there were not many people who had used the pen earlier. Still, I could tell this pen had been used and abused previously. The tip that was once an average 0.50 mm, had expanded to something that felt closer to 1.2 mm. The tip didn't split with age, like my Sharpie Pens liked to do, but just expanded very organically. Even though the pen had been to hell and back in the hands of unknown thousands of voters, it filled those bubbles perfectly and cleanly. I'll admit it to you, my loyal readers, and no one else, but I even made sure the bubbles were slightly over-filled just because I wanted to write with the pen a little more.